Apparently I make my coffee strong. This is news to me considering I just follow the directions put on my totally amazing "1 cup coffee maker" from heaven... It told me to put in 2 1/2 Tbsp of coffee for each cup. My brother-in-law (an avid coffee drinker) informed me the other day that he puts that same amount into a multiple cup coffee machine. I don't know who to believe-- my coffee machine instructions-- or my brother-in-law. I guess since I have been drinking it this way for the past year, I'll just keep it up. Alright-- time for what I like to call the "discovery of the week"! This is going to be a product, service, good advice, etc., that I have recently discovered and come to truly appreciate. I think, as a result, you will share in my new-found joy and also come to appreciate (and maybe even buy or use) the discovery of the week! I was watching TV last week (cause what else do I do with my life?) 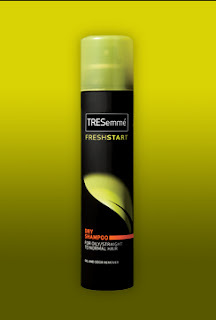 and I saw a commercial for a new hair product from TRESemme. And what was this amazing discovery? DRY SHAMPOO! That's right-- it's a shampoo that you spray on (or rub on) your dry hair. Then you wait 1-2 minutes and either brush it out (for straight hair) or pat it out with a towel (for curly hair). You don't need any water-- and it gets your hair clean! So, I am touting this new product. You can buy it at Walmart (and probably any drug store). I haven't tried out the one for curly hair-- but I bet it works just as well. And there you have it! Dry shampoo!!! I'm so excited-- in case you couldn't tell. congrats on it working and good luck for 3 days! First, I have to tell you that your coffee-to-water ratio is outrageous! I use 2 and 1/2 Tbsp for 4 cups of coffee. I think your coffee probably leans more toward espresso. Remember: if you have to chew your coffee, it may be too strong. Anyway my thought is that maybe your crrrrazy killer coffee is throwing your body chemicals off, causing your scalp oil glands to malfunction. Thus your one oily hair spot! Hm... maybe I'll make it weaker next time. This might explain why 2 cups makes me go crazy!